Watch a once “aggressive” Frech Bulldog get a bath! Once deemed too aggressive, see how far little Norman has come. He’s able to get a bath while remaining totally calm and collected. What a gem. [quote style=”1″]I know it might seem lame at first, but here is French Bulldog Last Chance Rescue Graduate, Norman, having a bath at the local walk in dog wash in Philadelphia where he is visiting his grandparents. You see Norman was turned away by another French Bulldog Rescue because he was too aggressive. 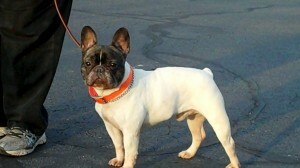 Learn more about Norman’s story on his page at the French Bulldog Last Chance Rescue.